Hardware drum machines and grooveboxes have made a big comeback in recent years. The models on the market vary enormously in terms of specs and price - there are plenty of both cheap and high-end drum machines available - but the common thread running through all of the products included here is that each one of them enables you to create beats without the need for any other gear. You won't find hybrid MIDI pad controller systems such as Native Instruments' Maschine and Arturia's SparkLE in this round-up, and we’ve excluded dedicated drum synths (ie, ones that don't have their own sequencers), too. How do I choose a drum machine? Obviously, price is going to be a significant factor when you choose a drum machine, but it's not the only consideration. You need to decide whether you want a portable model or something that's more likely to stay in your studio, and also what kind of sound generation features you want. Many drum machines use synthesis to generate their tones, but others also add sampling into the mix, giving you greater flexibility. Also consider audio outputs. If you want to process your drum hits individually, it's useful to have multiple outputs, so each sound can be sent to its own channel and treated with its own effects. So, what are the best hardware drum machines that you can buy? Based on our reviews, these are our favourite products on the market right now. Looking more like barebones calculators than drum machines, Teenage Engineering's Pocket Operators are fun and surprisingly flexible sound makers that can be had for a low price. There are three drum/percussion products in the range: the PO-12 rhythm; the PO-24 office, which deals in noise percussion; and the PO-32 tonic. This last model is the pick of the bunch as it enables you to import sounds from Sonic Charge's MicroTonic, allowing users to completely alter and overwrite its sonic palette. You can also sync the Pocket Operators with each other and to other gear. While they can be slightly fiddly to use, these machines are great fun, and come at a very affordable price. Taking inspiration (we suspect) from Roland's classic TR-808, the Volca Beats has an analogue and PCM sound engine but offers digital control, meaning that knob tweaks and note info can be recorded into the built-in sequencer. Volca Beats has six analogue and four PCM sounds: the kick can be clicky or deep, the hats cut nicely, and the snare has a woody tone that can be further bolstered by layering a PCM clap or increasing the amount of 'snap'. 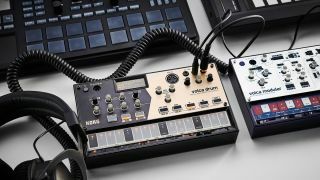 As with the other Volcas, connectivity options are somewhat limited, but ultimately, the Volca Beats is about fun, and that's what you'll have when you use it. If you want quality analogue drum sounds on a budget, look no further. Let's get this out of the way first - the TR-09 doesn’t sound exactly the same as a TR-909; however, the visual and functional similarities are clear, though the TR-09 has a much-reduced footprint and can be battery powered. Button placement is broadly similar, so anyone familiar with the 909 will be able to create Patterns and Tracks without reading the new manual. One downside on the TR-09 is the size and feel of the knobs, which make editing fiddly at times. There are some sub-functions littered throughout the interface, but these are generally indicated on the front panel. Portable and with the flavour of a real 909, The TR-09 is a drum machine that's capable of delivering great results. It would be easy to focus on the ‘authenticity’ aspects of the TR-08, but it is much more of a 21st century machine than the original TR-808 in quite a few ways beyond its DSP-driven sound engine. Although the programming system follows broadly similar lines to the original, you now have the ability to add sub-step beats, create random patterns and dial in some swing - all useful features. Compression can be applied individually to the Kick and Snare, whilst Tuning and Decay is available for some sounds (with the ability to select a long decay version of the Kick for those Miami bass lovers out there). This is a decent-sounding digital resurrection of a classic beatbox, though we'd still like to have seen a few more editing options and multiple analogue outs. A fully analogue drum machine, the DrumBrute features 12 synth tracks offering a total of 17 drum and percussion sounds. Each of these 12 tracks is accompanied by a velocity-sensitive rubber pad for playing the associated sound, along with a range of rotary knobs for shaping the sonic character. At this price point the DrumBrute is a triumph. It packs a solid assortment of quality sounds, with a sonic character distinct from its main rivals, plus a nice, smooth-sounding dual-mode Steiner Parker filter. The DrumBrute’s deep and creative sequencing capabilities are the real highlight, though, and coupled with its fluid workflow, they make it a great source of creative inspiration. The original TR-8 was built entirely around Roland’s Analogue Circuit Behaviour (ACB) tech, which emulates the circuitry of the original hardware units on a component-by-component basis. That same technology is still at the heart of the TR-8S, providing models of the 808, 909, 707, 727 and 606. This time around, though, these emulated instruments are joined by sample tracks. Any of the TR-8S’s 11 instrument tracks can be assigned to either an emulation or a sample, meaning that, alongside the expected pure emulation kits, the drum machine comes equipped with plenty of interesting hybrid kits, with lots of scope for mixing and matching the two sound sources. Those core ACB tracks once again offer high-quality, largely convincing recreations of the original boxes they’re based on. On the whole, the TR-8S is excellent. It builds on the potential of the original in all the right ways: it's a machine that’s far more flexible but still intuitive and, most importantly, a lot of fun to use. Offering a completely digital architecture, Digitakt features 16 channels divided into eight audio - ie, sampling - channels and eight MIDI channels. Samples can either be loaded via the internal memory or sampled from Digitakt’s audio inputs. The process of sampling is fast and fluid, and can be done without the need to pause the sequencer. While ‘digital’ is often, unfairly, seen as synonymous with cheaper or less ‘full’ sounds, there’s certainly plenty of heft to Digitakt’s sound engine. The bit reduction and overdrive are particularly good at adding extra body and grit to sounds, and the sample manipulation and looping tools mean Digitakt can take things into esoteric territory. It might look like a humble sampler, but with great sequencing and a decent crop of connectivity, the Digitakt could easily become the centrepiece of your studio or live rig. At the heart of the Rytm MkII you’ll find the same excellent eight-voice analogue/digital sound engine as found on the MKI, mated to the familiar 13-track sequencer. Each track is selected by pressing the track button and corresponding pad. The most obvious difference on the MKII’s front panel is that the old backlit pressure-sensitive rubber pads have been replaced by larger, softer versions so you can finally enjoy finger drumming on the Rytm (a huge improvement over the MKI). As before, each pad/track can contain one of nine ‘machines’, which are self-contained synth engines dedicated to making a particular type of drum sound. The MKII sounds just like the MKI, which is no bad thing. There’s plenty of low-end extension, punch in the mids and rounded, classy high end. The Rytm has been improved in all the right places: it's one of the very best drum machines and will keep you inspired for years. Like its bigger DrumBrute sibling, the Impact couples its sequencer with an all-analogue drum synthesis engine and very flexible pattern saving/song mode capabilities. Visually, the Impact looks pretty similar to its predecessor, housed in a solid, navy blue chassis familiar from the rest of Arturia’s ‘Brute range. The Impact is not, however, simply a cutdown version of the larger DrumBrute - much of the sound engine has been overhauled here, and the overall range of sounds has been switched up. The sequencer Roller and Beat Repeat tools are a couple of handy options for spicing up fills and turnarounds; the ample crop of 64 pattern slots means there are plenty of space to save and recall grooves; and the Song mode means these can easily be stitched together into full arrangements. While the Impact lacks a little sonic flexibility and isn’t all-round perfect, it is an inspiring and enticing drum machine at a very good price. Single audio output is a little restrictive. While the other Volca beatmakers - Volca Beats and Kick - both condensed analogue drum synths into the range’s compact hardware format, the Drum uses digital synthesis to create a percussive palette that’s broader, and weirder, than its predecessors. Rather than use PCM samples, as many digital drum machines do, the Volca Drum’s sound engine uses a system of virtual analogue oscillators, modulators and resonators to create its percussive sounds. The sound engine has six parts, each of which is identical, and each part has two identical layers. For designing sounds, this multilayer engine is considerably deeper and more interesting than anything we’ve seen on a Volca beatmaker before, but than anything, it’s just nice to play with a drum machine that goes beyond aping the same old ’80s drum boxes. For dance music producers, this is a must-try. Circuit is a standalone, digital instrument featuring a four-part sampler, two six-note polyphonic synths and a deceptively deep sequencer. In the words of Novation, Circuit is "designed to inspire", with a heavy emphasis on immediacy, intuitiveness and experimentation. At launch its sample channels functioned as a pretty basic drum machine – restricted to simply playing back pre-loaded sounds – but Novation’s browser-based Components app now gives users an easy way to stock Circuit with samples from their own library. As well as its sample capabilities, Circuit boasts two excellent digital synths engines, an inspiring workflow and a sequencer that bests instruments four times its price. For those reasons it comes highly recommended, particularly if you want more than just a drum machine in a single box.